CCC4TT is now collecting items for military dogs in Afghanistan. When SPC Christopher Velasquez returned from is deployment in Afghanistan he drove to Cape Cod to meet with Dylan and thank CCC4TT for the care packages and support sent to him and his fellow soldiers. SPC Velasquez shared with us Rocky’s story and the supplies needed for military dogs in Afghanistan.We are proud to introduce “Rocky’s Warriors” Cape Cod Cares for the Troops program to send care packages to our canine heroes. Here is Rocky’s story according to his handler and friend SPC Christopher Velasquez Rocky 25 was a German Shepherd from Holland where he was the National Tracking Champion, along with several smaller championships under his collar. Over time Rocky was unable to perform on the competition circuit due to his age. A private organization who contracts dogs out to military and civilian law enforcement agencies brought Rocky over to the United States to help with the tracking suspects for the police and military. I went through Combat Tracker Dog School in the summer of 2009 and became Rocky’s handler. Right from the beginning we were a perfect team. We deployed March 18th, 2010 to Masar E Sharif, Afghanistan with the 1st Brigade Combat Team of the 10th Mountain Division. Rocky and I performed many tasks and missions essential to combating terrorism and attacks against coalition forces. 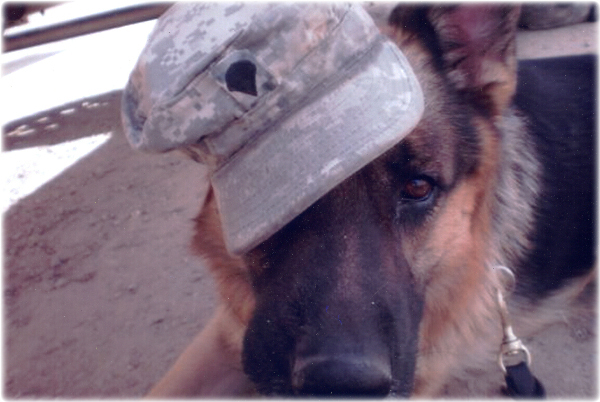 Sadly while still deployed in Afghanistan, Rocky passed away just one week after his 7th birthday. *** Checks can be made out to CCC4TT or click on the Paypal "Donate" link at the top right of the home page to donate with a credit / debit card. Please write "Rocky’s Warriors" on the memo line.